This is a game in which you can redesign a line of your choosing. You can redesign any line in the system today, like CPW, 7th Avenue, 6th Avenue, or Queens Blvd. You can move express stations, add tracks, or remove tracks. The only rule in the redesign is that you have to keep the geographic route of the line the same. You can add extensions but the existing part has to remain. I would make the Lenox Avenue line a 4 track line, with trains going express and trains going local. An express stop would be at 135th Street. The other stops would be local. I would make the line from 96 Street to 242 Street have 3 tracks along its entire route. The and would run. The would run local, and terminate at Dyckman Street, while the would run peak direction express, and terminate at 242 Street. It would run express south of Dyckman Street, with express stops at Dyckman Street, 168 Street, and 137 Street. The would have provisions to be extended eastward along Fordham Road. In Manhattan south of 96 Street, the would be local and the would be express. This couldn't actually happen but it is fun to make plans. How would you redesign a line? I don't understand the purpose of these arbitrary rules for proposals. The whole and thing seems unnecessary. The does fine as-is and a merge at 96th won't go well. The express stop on Lenox should be at 125th and if you want you can add one at 110th too. These aren't actual proposals but rather if you were to redesign the subway system, how would you do it. if you were to redesign the subway system, how would you do it. Isn’t that what every proposal on this site is? A new two track line is built over the river and connects with the at 161st St-Yankee Stadium. The operates some peak-direction express trains between Bedford Park Blvd and 125th St. Rebuild the junction at 138th St into a flying junction so that merging trains automatically go into the express track to not clog up the on the local. If you are going to do something to fix the conga, send the and to 179th and have the run express on Hillside. The local lines may have lower ridership, but at least the conga and the merge at 75th is eliminated. CBTC will also only add 2-3 express trains. The runs 6 tph. 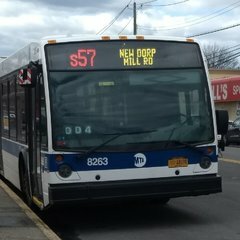 If we are to redo QBL, send the via the express to Jamaica Center and via 63rd, while the runs local via 53rd to Forest Hills. Riders can have 53rd or express, but not both. I really don't understand this fascination with 179. Yes, it has 8 relay tracks, but relay capacity has rarely been the limiter in such operations -- it's usually fumigation that kills capacity. As such, while its 2 pairs of tracks should be able to turn up to 40tph, I don't see it being some saving grace for 71st. Between the fumigation delays inherent in turning the and the merge delays resultant from efforts to mitigate them, I see little benefit in extending both those locals out there -- especially given the already grotesque length of the . But Forest Hills has to be the worst terminal to have trains terminating at. You obviously can't send them to Jamiaca Center, so 179th is the only viable option. What we can do is have some rush hour And trains extended to 179th St, which is when the delays at Forest Hills start happening. You sure you really want fumigation delays at Queens Plaza on the express tracks? Remember the turning procedure for QP is via the layup track (D5) beyond the station. Also remember that by extending the , you're cutting 1 seat local access to Queens Boulevard stops which'll almost certainly result in even more crowding on the expresses. What I would do at least in the short term is what Lawrence st proposes -- just send some trips (esp. those that lay up on Hillside anyway) to 179. Gives 71 some time to regroup at least. Point taken on - that was basically a "how to avoid a switching delay between express and locals so isn't held up waiting for to decide to show up" idea. But I'm confused by your comment on and a one-seat ride since my thinking was forcing folks to transfer at QPLZ would make the local be utilized more while relieving crowding - due to not waiting, being more reliable by reducing the route length 30-40% and having it supplemented by (under the assumption that additional consists on would become available by redirecting R46s to and ). The whole system needs to be blown up and start from scratch. What's your plan to restart the whole system? Hypothetically speaking the whole system would have welded rail, Els would be sound resistant, better drainage systems, timers only in areas to protect possible train derailment. Alao the Nostrand Ave line would extend to Marine Park with express tracks. One thing I would definitely do is Reconstructure the lines in Queens. The would go to Leffords Blvd and The would go to Far Rockaway full time. (There will still be Rush hour trips to Rockaway Park. This should reduce the 20+ min headways in the Rockaways/Lefferts during off-peak hours. Late nights, The would become a shuttle from Broadway Junction to/from Leffers Blvd. I would redesign the Sea Beach line. I would like to rebuild each station and the express tracks. I would like to reintroduce express service along the Sea Beach line. I am not certain where express stations would be except one would be New Utrecht Avenue. Your Express Stops should be New Urchet Avenue, Bay Parkway, and 86th Street. To create minimal interlining, you could have 86th Street as your terminal for Local trains which will head Straight to Coney Island Yard. Local riders would be short of one stop to Coney Island, but this is to not to pass the capacity limit at Coney Island. New interlockings are installed just before 86th for terminating trains, which head straight to CIY. The middle track is mainly just for testing, but runs a special Summertime peak run (the ) for Coney Island Bound passengers. Makes more sense to do Bay Pkwy, Utrecht and 8th based on ridership and connections- 86th can remain local given its lower ridership. I’m not sure the Sea Beach Line even needs an express, given that it only has nine stops and the starts going express after 59th Street. But those three would make sense to be the “express” stops...well, at least Bay Pkwy and 8th Avenue, which are the busiest Sea Beach stops by far.